Maurice's Motel is located on 128 Main Street, Canaan, Vermont. 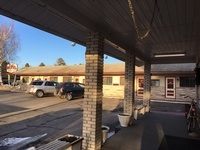 At Maurice's Motel there is plenty of parking and the accommodations have everything you need for a comfortable stay. Across the street is the Time Out Tavern bar and restaurant. With a short walk or drive, you can be at Solomon's grocery store, a gas station, kids playground, and a walking park. Maurice Motel is located directly on the snowmobile trail and Ride The Wilds ATV trail. Park and ride! We are within walking distance to Connecticut river canoe launch, and fishing. We are 1/2 mile to the Canadian border, and 200 feet to NH. Come and enjoy a relaxing stay in northern NH, at Maurice's Motel. We look forward to serving you!